Hour of Code • Events to give kids a look at behind-the-scenes computing continue all week. Al Hartmann | The Salt Lake Tribune Sixth-graders at Layton Elementary School get an introduction to computer programing during the annual Pluralsight Hour of Code event Tuesday Dec. 9, 2014. Riverton HIgh School junior Katya Eames, center, on the Pluralsight development team, coaches Gracee Scott, left. 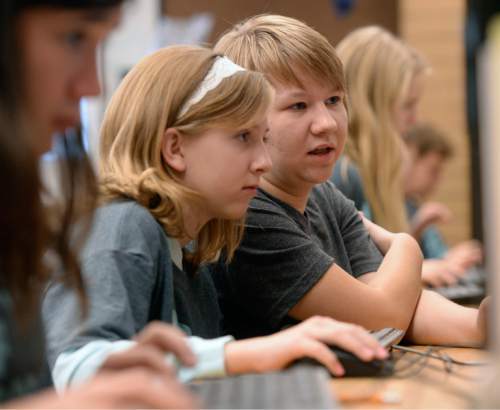 Al Hartmann | The Salt Lake Tribune Sixth-graders at Layton Elementary School get an introduction to computer programing during the annual Pluralsight Hour of Code event Tuesday Dec. 9, 2014. Riverton HIgh School junior Katya Eames, center, on the Pluralsight development team, coaches Gracee Scott. Al Hartmann | The Salt Lake Tribune Sixth-graders at Layton Elementary School get an introduction to computer programing during the annual Pluralsight Hour of Code event Tuesday Dec. 9, 2014. Riverton HIgh School junior Katya Eames, center, on the Pluralsight development team, coaches Sophie Mee. 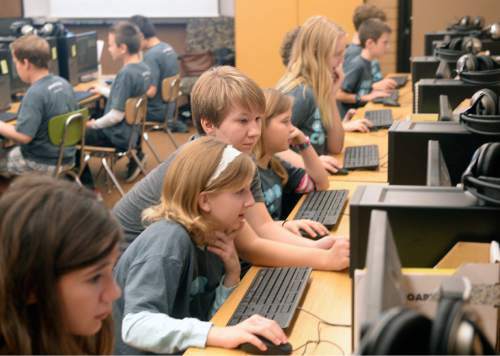 Al Hartmann | The Salt Lake Tribune Sixth-graders at Layton Elementary School get an introduction to computer programing during the annual Pluralsight Hour of Code event Tuesday Dec. 9, 2014. Riverton HIgh School junior Katya Eames, center, on the Pluralsight development team, coaches Gracee Scott. 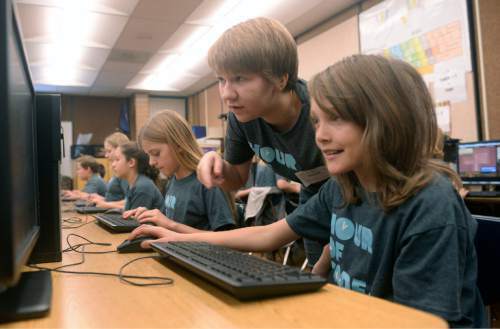 Al Hartmann | The Salt Lake Tribune Sixth-graders at Layton Elementary School get an introduction to computer programing during the annual Pluralsight Hour of Code event Tuesday Dec. 9, 2014. Al Hartmann | The Salt Lake Tribune Sixth-graders at Layton Elementary School get an introduction to computer programing during the annual Pluralsight Hour of Code event Tuesday Dec. 9, 2014. Pluralsight instructor-author Joe Eames starts the coding class. Al Hartmann | The Salt Lake Tribune Pluralsight instructor-author Joe Eames gives helps sixth-graders at Layton Elementary School get an introduction to computer programing during the annual Pluralsight Hour of Code event on Tuesday. Al Hartmann | The Salt Lake Tribune Sixth-graders at Layton Elementary School get an introduction to computer programing during the annual Pluralsight Hour of Code event on Tuesday. Al Hartmann | The Salt Lake Tribune Sixth-graders at Layton Elementary School get an introduction to computer programing during the annual Pluralsight Hour of Code event Tuesday Dec. 9, 2014. A year ago, Katya Eames had little interest in computers and computer programming. The Riverton High School junior said she imagined the industry was filled with aging, balding men who spend their days playing online games like World of Warcraft. "I liked computers mainly because I could go on YouTube and watch videos," she said. But that was before her father encouraged her to take a coding class, something Eames thought would be "the most boring thing ever" but led to a newfound passion. Eames now hopes one day to work for the software giant Google. She studies computer programming every day as part of a concurrent enrollment program at Salt Lake Community College. "That&apos;s all I do for two and a half hours," she said. "I code." The Riverton teen was at Layton Elementary School Tuesday sharing her love of computer programming with a classroom of sixth graders as part of the annual Hour of Code initiative. "Coding is fun," she said. "It looks like it&apos;s a boring old guy&apos;s job but it&apos;s a lot of fun." Hour of Code is a nationwide effort to introduce children to computer programming by hosting one-hour introductory programming lessons in schools. Gov. Gary Herbert had a lesson in rudimentary coding Monday at the State Capitol. Similar events will be held throughout the state this week. At Layton Elementary, students learned by playing Code Combat, a free fantasy game hosted at code.org that asks players to input coding sequences to move through obstacles on a map. "It&apos;s pretty easy once you get the hang of it," said Grace Scott, a sixth grade student at Layton Elementary. 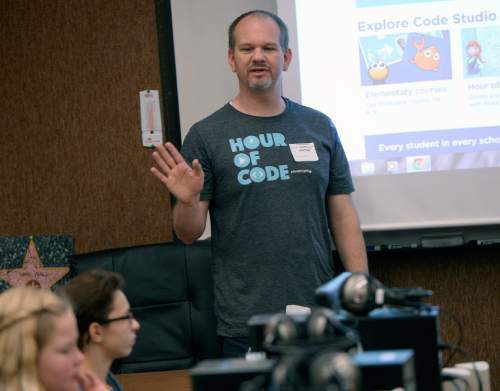 Eames&apos; father Joe Eames, a programmer with the Utah education software company Pluralsight, said the goal of the Hour of Code events is to hopefully inspire student to pursue careers in computer programming. 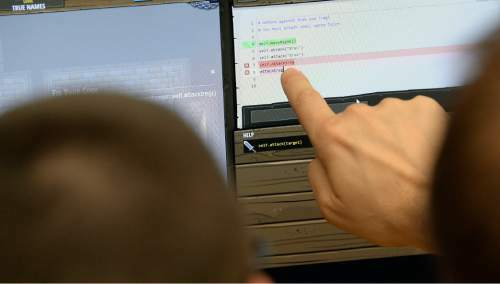 But no matter what vocation a person chooses, he said, it&apos;s increasingly beneficial to have an understanding of computer coding. "Regardless of whether they use it or not, it&apos;s a skill that won&apos;t hurt them," Eames said. "In this day and age, you&apos;d have to really search hard to find a job that can&apos;t be improved in some way with the effective application of information processing." 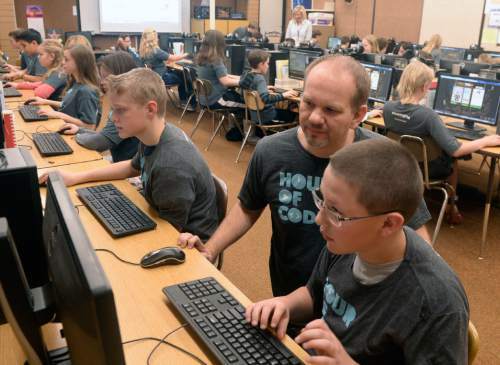 Technology education, like the Hour of Code initiative, has become a focal point of Utah&apos;s governor and other policy makers who call for investments in STEM, an acronym for science, technology, engineering and mathematics. Recent legislative actions have created Utah&apos;s STEM Action Center, which coordinates technical education in the state, and encouraged schools to enhance their STEM curricula. The State School Board has also discussed making changes to state policy that would result in students taking more computer science classes and being introduced to STEM fields at a younger age. In June, the board approved a policy change allowing high school students to take computer science as one of their required science courses. And starting next year, a career and technical education course required for all seventh graders will be revamped to include coding and other STEM subjects. "It will have a much stronger STEM component," said Carl Lyman, a technical education specialist with the State Office of Education. "There will be about seven or eight days of computer science activities that have not been there in the past." Lyman said the changes have been made with an eye toward preparing students for an increasingly technology-based workforce. But, he noted, coding also teaches problem solving, computational thinking and collaboration skills that are useful in any career. "The coding becomes beneficial even if they never pursue it in their occupation," Lyman said. For Katya Eames, there&apos;s another benefit to introductory coding lessons at the elementary level: Women are unique in the male-dominated computer programming industry and Eames said changing that trend depends on having students learn to code at a younger age. "It&apos;s especially around this time that girls start feeling that they need to be girly and pretty," she said. "We need more girls (who code) because they&apos;re really good at it and they bring a new perspective and new ideas." Eames said that before she learned how to code, she assumed it would require long hours of difficult and boring work. But she said there are lot of programs that make it easy for a beginner to get a taste for coding. She gave the example of programs like Wordpress that assist a person in creating a custom website. It&apos;s easy to simply write content and let the program do the work, she said, or a person has the option of using coding commands to fine tune their work.